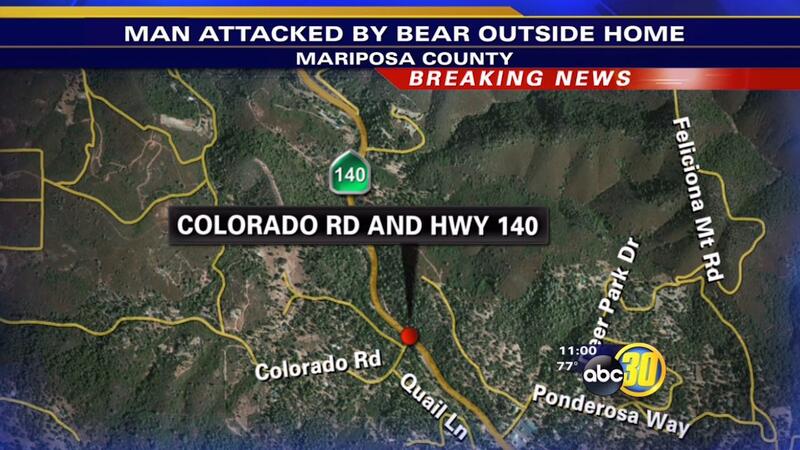 FRESNO, Calif. -- The Mariposa County Sheriff's Office said a 67-year-old man was attacked by a bear around 4 a.m. Thursday. The incident occurred at a home on Colorado Road near Highway 140 in Midpines. The California Department of Fish and Wildlife said they believe the bear was rummaging through the man's trash when he stepped out of his house in the early morning hours while it was still dark. The man was able to fight off the bear and made it back into his home. He then drove himself to the hospital. The victim sustained lacerations and puncture wounds to his legs, arms, abdomen, hands, and feet, according to the California Department of Fish and Wildlife. They said he is stable and has received his first round of rabies and antibiotic treatments. The Mariposa County Sheriff's Office and the California Department of Fish and Wildlife are warning residents in the area to be aware of their surroundings, keep an eye on children and pets. California Department of Fish and Wildlife wardens are in the area actively searching for the bear. They said if anyone encounters a bear, do not approach and call 911 immediately.